Skies will remain gray on Monday in many western areas of Korea as fine dust from China fills the air. 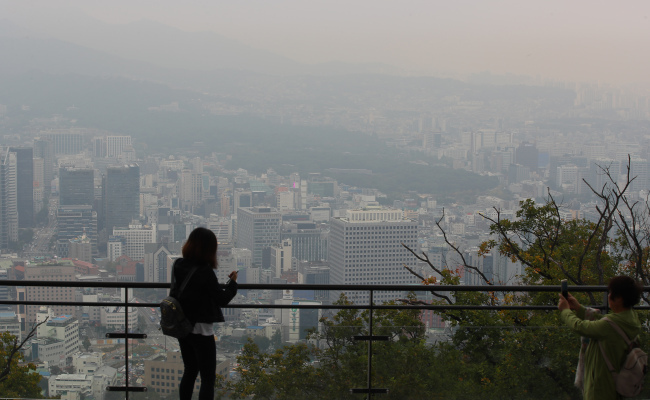 The density of fine dust in the air will hit “bad” levels throughout the day in Seoul, Gyeonggi Province, the Chungcheong provinces, North Jeolla Province and western parts of Gangwon Province, according to the National Institute of Environmental Research. The temperature on Monday morning plunged to 5-14 degrees Celsius, slightly colder than average for this time of year, but daytime highs will rebound to 19-22 C in the afternoon. The wide daily temperature ranges will continue for a while, the Korea Meteorological Administration said. The weather agency advised residents in Korea to take extra care to prevent fires, as sunny skies across the country will bring dry air.